Many know of garnet in the traditional sense: a deep and dark red gemstone. They’re often surprised to learn that the red variety, known as pyrope, is just one of several families that comprise the garnet group. Follow along as we cover spessartine garnet, a variety that can vary between colors, most notably yellow-orange to reddish-orange. Garnet encompasses a broad range of gemstones within its large family. Comprised of several individual species this gem enjoys a wide variety of colors. As with other garnet types, gems are a blend of more than one type, adding a subtle layer of variation not seen in most other gemstone families. 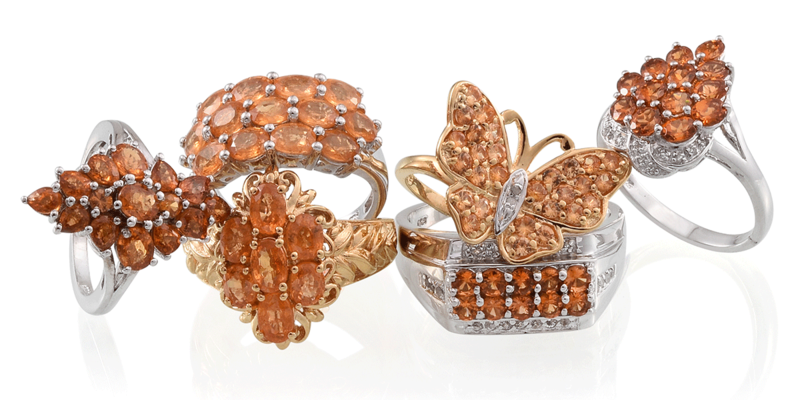 What is recognized as spessartine garnet is mixed between two main varieties. 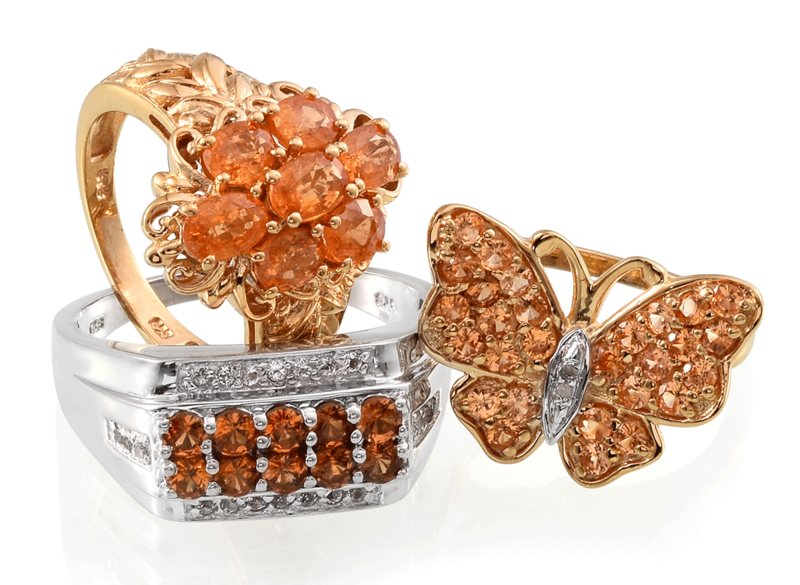 Spessartine garnet is the primary influence, providing the orange hue. The more spessartine present, the lighter the color becomes. On the other hand, almandine is responsible for the red color and occasional brown tones. The greater the presence of almandine, the deeper these colors become. 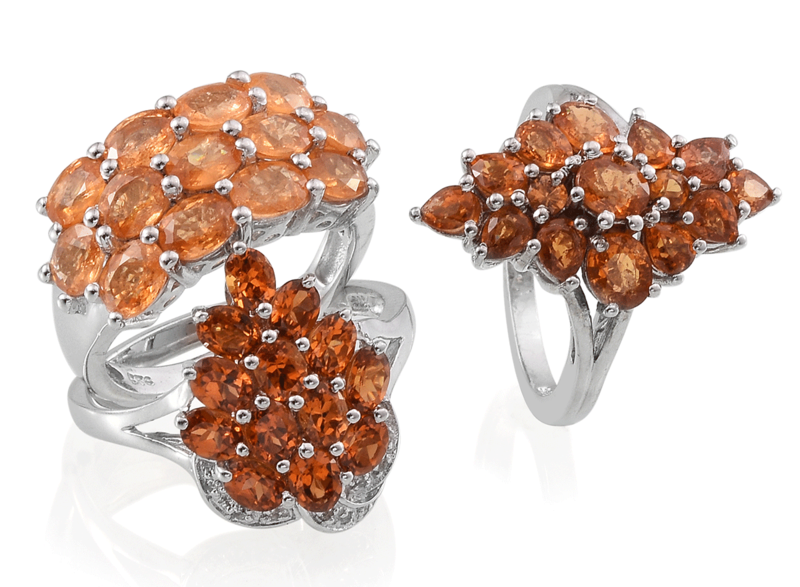 Mandarin Garnet is an orange-yellow garnet from Namibia. Kashmirine is an orange-red variety from Kashmir, Pakistan. Viceroy Spessartine from Ibadan, Nigeria is bright orange in color. Now found worldwide, from a variety of sources, spessartine garnet was first discovered in Bavaria, Germany. Spessart is a wooded region of Germany. Spessart means “woodpecker forest” when translated. Garnet has a slightly longer story behind its name. Middle English provided the word gernet, which means ‘dark red.’ The Middle English word comes from Latin, originally granatus. In Latin, this word referred to seeds, and some scholars have suggested this is in reference to pomegranate fruit. The fruit is known for its dark red seeds. Spessartine garnet may sometimes be known as spessartite garnet. In the early 1970’s the International Mineralogical Association suggested that the gem variety be referred to as spessartine to avoid confusion with the mineral spessartite. In the modern gem trade, both names continue to see use, with a gradual shift toward favoring spessartine as the preferred term. Ranks 6.5 to 7.5 on the Mohs scale. Colors range from yellow to orange to red to brown. Polished, it possesses a vitreous, or glass-like, luster. Sourced worldwide, with individual localities providing unique specimens. Spessartine garnet is generally not treated. Visit our Education Center and begin exploring the exciting world of gems today! Previous post Beaded Necklaces, the Original Accessory?